Fiber optic connectors are required in every application area where optical fibers are used for the transmission of signals. Fiber optic connectors are used in public telecommunications network, outside plant applications, and in wiring installations at customer premises. An increase in the demand for high bandwidth in telecommunication networks is primarily driving the global market. Telecom vendors have gradually ventured into optical networking, which is inherently capable of carrying a higher bandwidth capacity than the existing infrastructure. Moreover, the application of fiber optic connectors in the medical, aerospace, and military sectors is set to bolster the global fiber optic connectors market. Governments of several developing countries, such as China, India, and Brazil, are investing in the deployment of fiber optic connectors in order to improve the network infrastructure, which in turn, is anticipated to further increase the demand for optical interconnects. The global fiber optic connectors market was valued at US$2.9 bn in 2015 and is estimated to expand at a CAGR of 7.7% to reach US$5.6 bn by 2024. The global fiber optic connectors market, by type, is segmented into lucent connector (LC), standard connector (SC), multiple-fiber push-on/pull-off (MPO/MTP), straight tip (ST), MXC, and others. In terms of revenue, lucent connectors were the leading contributors to the global market in 2015, followed by standard connectors. The market for LC is expected to show substantial growth during the forecast period. However, the telecommunication industry is steadily switching to a new type of fiber optic connector – MXC connectors – owing to their higher count of multi fiber position options, compact size, lower cost, less weight, stronger resistance to debris sensitivity, no need for fiber polishing, and higher performance capacity. Thus, MXC connectors are expected to record significant growth through 2024. On the basis of applications, the global fiber optic connectors market is categorized into telecom, datacom, dense wavelength division multiplexing (DWDM) systems, lasers, and others such as military, medicine, and cable TV. The telecom industry held the dominant share in 2015 owing to the importance of fiber optic connectors as the preferred medium for the transmission of data in telecommunications networks. The increasing demand for greater telecom capacity and faster internet services has resulted in the extensive use of optical fiber connectors in telecom networks. 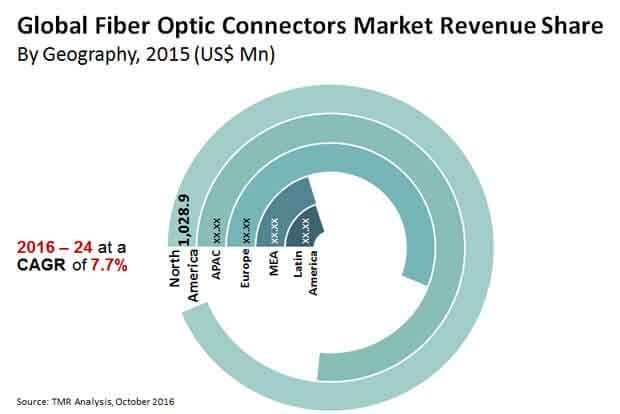 North America is projected to be the leading regional market for fiber optic connectors during the forecast period, primarily owing to the rapid penetration of multi fiber connectors in data centers. Applications such as cloud computing, video, virtualization, switching/routing, and convergence are driving the need for bandwidth expansion in data centers and 4G/LTE networks. In North America, the U.S. is set to represent the domain share in the fiber optic connectors market. Hardened fiber optic connectors (HFOCs) are passive telecommunication components that are used widely in the U.S. to withstand climatic conditions such as snow, high winds, ice storms, and sleet. Asia Pacific held a prominent share in the global fiber optic connectors market in 2015 and is anticipated to expand significantly from 2016 to 2024. Developing countries such as China and India have witnessed tremendous economic growth in the recent years, driven by rapid development in sectors such as telecommunication and IT, among others. This, in turn, fuels the growth of data centers in the region, thereby resulting in the increased demand for fiber optic connectors. 3M, Alcatel-Lucent SA, Amphenol Corporation, Arris Group Inc., Hirose Electric Co. Ltd., TE Connectivity Ltd., Furukawa Electric Co. Ltd., Hitachi Ltd., ZTE Corporation, Corning Cable Systems LLC, Sterlite Optical Technologies Limited, Broadcom Limited, Ratioplast Electronics, Diamond SA, and Sumitomo Electric Industries are some of the leading player in the global fiber optic connectors market. Fiber optic connectors (FOC) are used to mechanically connect two optical fibers, thereby permitting light to transmit from the core of one fiber to the other fiber in order to link the fiber optic connection equipment. The factors which are primarily driving the growth of global fiber optic connectors market are increasing demand for high bandwidth in the telecommunication industry and increasing demand for transmission speed and data volume in the data centers. The key features of fiber optical connectors such as low power consumption, cost effectiveness, and high data throughput are expected to fuel the growth of these connectors in the next generation warehouse-scale data center networks. In addition, the increasing application of these connectors in several application areas of the medical sector is playing a significant role in the growth of the global fiber optic connectors market. Furthermore, large scale production and technological advancements of fiber optics is also driving the growth of the global market. The conjoint effect of all these drivers and trends is therefore set to bolster the growth of the global fiber optic connectors market during the forecast period from 2016 -2024. The rapid growth of the internet and cloud computing has resulted in bandwidth requirements for data center network. This is in turn expected to increase the demand for optical interconnects in the next-generation data center networks. Furthermore, advancements in fiber optic technology have led to the growth in requirement for optical sensors and data links in several applications including defense and aerospace.By deploying the advanced technologies in this field, the manufacturers can utilize this opportunity to increase production in a cost-effective manner as well as satiate the growing demand for fiber optic components among consumers. However, phenomenal growth in the wireless networking system is hampering the advancement of fiber optics. Moreover, the high cost and low level of automation of fiber optic connectors might also restrict the growth of the global market. The global fiber optic connectors market has been segmented on the basis of types, applications and geography. A cross sectional analysis of the global fiber optic connectors market broadly across five geographical segments has also been covered under the scope this report. A comprehensive analysis of the market dynamics which include, market drivers, restraints and opportunities has been included under the scope of this report. Market dynamics are the factors which influence the growth of the market and thereby help to understand the current trends in the market. The market drivers have been analyzed from the economic, demand and supply side. Therefore, this reports offers an exhaustive study on the global fiber optic connectors market and also provides the forecast of the market from 2016 - 2024.The present market size in terms of revenue (USD Million) along with forecast from 2016 to 2024 is also provided in this report. To provide a detailed insight into the market dynamics of the global fiber optic connectors market, market attractiveness analysis has been provided in the report. The competitive profiling of the leading players in the global market and their respective market shares across the five major geographic segments namely, North America, Europe, Asia Pacific, Latin America and Middle East and Africa have been covered under the purview of this report. In addition, the distinct business strategies which have been adopted by the key players have been included in the report. Some of the major players in the fiber optic connectors market are Broadcom Limited (Singapore), 3M (The U.S.), Furukawa Electric Co. Ltd (Japan), Corning Cable Systems LLC (The U.S.), Alcatel-Lucent SA (France), Hirose Electric Co. Ltd (Japan), Hitachi Ltd. (Japan), Diamond SA (Switzerland), Arris Group Inc.(The U.S.), Sumitomo Electric Industries (Japan), Amphenol Corporation (The U.S.), Sterlite Optical Technologies Limited (India), TE Connectivity Ltd.(Switzerland), ZTE Corporation (China) and Ratioplast Electronics (Germany), among others.